An official at Samsung Electronics threw the question back to The Korea Herald when asked what Samsung executives and employees think of the latest comments by Kim Sang-jo, chairman of the Fair Trade Commission. Kim said in interviews with local media last week that Samsung needed a new control tower to coordinate all affiliates. He publicly urged Samsung heir apparent Lee Jae-yong to take action to overhaul the corporation’s governance structure across major Samsung companies. In the chairman’s definition, the new control tower should have both authority and responsibility. Such a body should only make tentative decisions and let the boards of each affiliate make their own decisions independently. Kim’s comments came some 100 days since Samsung heir Lee was set free after serving an about yearlong jail term for involvement in a political bribery scandal, which had also sparked the closure of Samsung’s Corporate (Future) Strategy Office. Lee has maintained a low-profile since then, only making overseas trips to meet with key business partners. The call for a new control tower drew immediate criticism from the industry, as it appeared to be a complete reversal of his previous denunciations of Samsung’s former control tower. Samsung decided to disband the Corporate Strategy Office in February 2016 along with the notion of “Samsung Group,” as the conglomerate came under fire for bribing former South Korean President Park Geun-hye in exchange for support for Lee’s leadership inheritance from his ailing father Lee Kun-hee. Most senior officials who worked for external relations of the group and the owner family at the closed control tower were dispersed to major affiliates such as Samsung Electronics, Samsung C&T and Samsung Life Insurance. With the absence of the control tower over the last two years, the 62 Samsung affiliates have been operating independently with the minimum level of formal control or coordination from a single decision-making body. 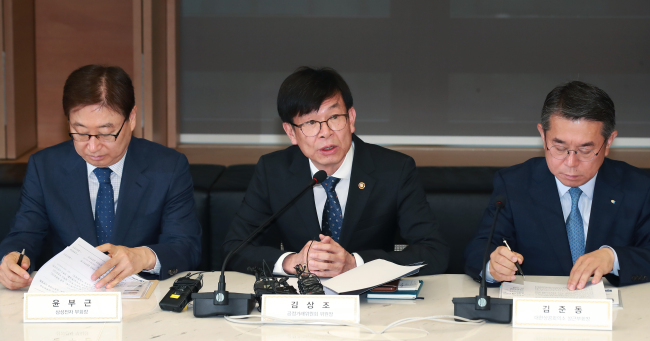 Samsung Electronics has been running a task force of former officials from the Corporate Strategy Office in order to support the coordinating work with its affiliates. “Samsung’s affiliates are now heading toward autonomous management as their board of directors are playing the central role,” the official added. However, industry sources have said decision making processes at the conglomerate under the new system resulted in delays and mixups. In response to the criticism of Kim, the antitrust watchdog said the chairman’s comments about the Samsung control tower have been somewhat exaggerated.